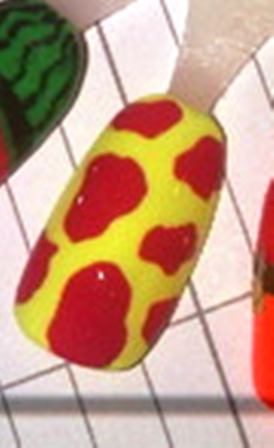 It was bright, different and fun... all the things I look for in nail art. I wasn't sure how I'd recreate it (as there were no instructions on how to do the look), but I put my thinking cap on and gave it a try! 1 coat of "lemon fizz" to serve as base coat and saturate nail with all over color. I let this dry completely and then added a 2nd coat. While this was still wet, I applied "monsooner or later" in a random pattern over the nail. Now the tricky part... you must let this dry COMPLETELY before putting on your top coat... and this will take a while to dry. I'm not a patient person and it was driving me crazy sitting here literally watching paint dry lol. I jumped the gun a few times thinking I could put on my top coat and it cause the red color to bleed out a bit. This is a good design to do while you're reading a magazine or watching tv.